A series of events steered Arkansas native Ronnie Hawkins away from his home state to the province of Ontario and eventual lifelong residency in Canada. A fun-loving work-avoider, Ronnie had a hard time figuring out how he wanted to spend his adulthood; studying at the University of Arkansas didn't stick, a short stint in the National Guard ended prematurely, running a nightclub pinned him down to one spot for too long. Drawn to rhythm and blues as an adolescent, he became fixated as his singing career unfolded in restaurants, bars and seedy nightclubs. In Ontario, "Rompin' Ronnie" gained an earnest following, whereas he seemed to be one of many, just Ron if you please, south of the 49th parallel. Ronald Cornett Hawkins was born in Huntsville, Arkansas on January 10, 1935, just 400 miles from Tupelo, Mississippi, where mom Gladys cradled two-day-old Elvis Aron Presley. The only connection the toddlers had was in Morris Levy's mind; some 24 years later, the head of Roulette Records would earmark Hawkins as a potential heir to the conceptual throne left vacant when Presley entered the Army, a revenue-driven pipe dream far from realized. But that came after a winding growth process that took hold in the late '40s when Ron, living in the larger Arkansas city of Fayetteville, discovered crackly late-night AM radio shows on black stations like WDIA in Memphis. Dale Hawkins, his cousin from Shreveport, Louisiana, scored a hit in 1957, "Susie-Q," a big score that seemed to escape Ron's comprehension. He got around to forming The Ron Hawkins Quartet that year with Willard "Pop" Jones on guitar and brothers Jimmy Ray and George Paulman on guitar and bass, respectively; Ronnie sang but didn't bother to learn to play a physical instrument. The guys performed in various dives, their selections built mainly on the Bo Diddley beat made famous by cousin Dale's famous Checker Records labelmate. Another guitarist, Levon Helm, who'd grown up around Turkey Scratch, a glorified field near Marvell, Arkansas, had once been in a band with his sister Linda called The Jungle Bush Beaters. He wanted to be in Hawkins' group badly enough to learn to play drums, little realizing he might never get out from behind the kit. 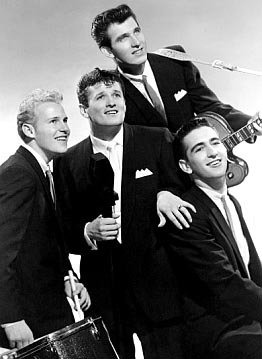 Shortly afterwards, in early 1958, the quintet headed to Hamilton, Ontario, following a lead set by Conway Twitty, who gained steady work there in the days prior to his late-'58 star turn "It's Only Make Believe." They played a place called the Grange and were more readily accepted by the locals than they had been back home...plus opportunites were abundant in nearby Toronto, Canada's second-largest city, a million-plus metro megalopolis. The name was shortened to The Hawks. There were few reasons to return to the U.S.
Dan Bass of Toronto's Quality Records spotted the band and supervised a recording session of "Hey! Bo Diddley" and a Ronnie original, "Love Me Like You Can," one of the few instances of a U.S. artist making his debut recording on a Canadian label (Hawkins reversed Jack Scott's direction; the Windsor-born singer had moved across the border to Detroit before making his first records the previous year). 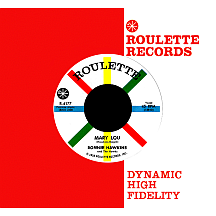 Sales were nearly nonexistent, yet Levy took notice and offered "The Hawk" a contract with Roulette Records and he just couldn't pass up the chance to make music for a big N.Y. label. "Forty Days," while credited to Hawkins and Jacqueline Magill (she was assumed to be Levy's girlfriend, but regardless, we all know how that little money-siphoning trick works! ), was actually Chuck Berry's "Thirty Days" with an extended deadline '...to get back home.' The single served as a solid debut, reaching the top 50 in June 1959. Ronnie's sophomore single was another tribute to a bluesy rocker he'd heard a few years earlier. Dallas, Texas-born Young Jessie waxed a killer tune for L.A.'s Modern Records in 1955; "Mary Lou" featured backing vocals by The Cadets and contained ruthless lyrics about '...a girl who'll make a fool of you,' who '...took my watch and chain...my diamond ring...the keys to my Cadillac car...' as well as '...a '55 Ford and a two-dollar bill.' As Modern's Samuel Bihari, using the pseudonym "Sam Ling," had taken half of Jessie's royalties, so had he been exploited by Levy with the Hawkins-Magill designation. But enough of that. 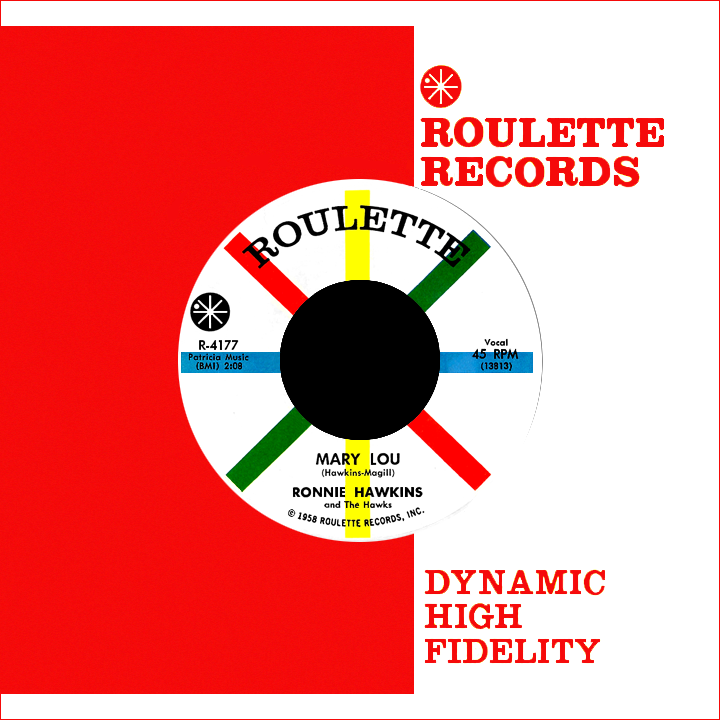 Ronnie's "Mary Lou" cooked in a way that differed from Jessie's; an August '59 American Bandstand appearance perpetrated another nickname, "Mr. Dynamo," and paved the way for its September surge into the top 30. "Southern Love," a haunting variation on Chuck Willis's 1956 hit "Whatcha' Gonna Do When Your Baby Leaves You," made a momentary appearance on national charts in early 1960. "Lonely Hours," cowritten by Hawkins with Narvel Felts (a singer also obsessed with R&B), took a U-turn into teen territory. Other 1960 releases included a "Ruby Baby" closer to Dion's '63 smash than The Drifters' '56 original, Gershwin classic "Summertime" and Hank Williams' "Cold, Cold Heart," Ronnie's most countrified effort yet. A new lineup of Hawks from various parts of Ontario gradually came together over the course of 1960 and '61; Jaime Robbie Robertson joined the group as bassist, wrote a couple of songs with Ronnie and later switched to lead guitar, Rick Danko started off on rhythm guitar and moved to bass, Richard Manuel joined as pianist and sometimes-drummer and Garth Hudson came along to play several, mainly keyboard, instruments. Helm, the only holdover, remained on drums and occasionally played guitar. Remakes of Diddley's signature hit "Bo Diddley" and Huey (Piano) Smith's "High Blood Pressure" made their way to vinyl before the contract with Roulette became null and void sometime in '63. By 1964 the new Hawks decided they were ready to break away from Ronnie and make it on their own (besides, they weren't getting along with him all that well and there was an issue with the pay split). Ron started his own Hawk label and had a number of Canadian-only releases of older R&B, rock and blues tunes. The Hawks had a single in 1965 on the Ware label (also on Apex) as Canadian Squires, then performed as Levon and the Hawks for a few years, with a couple of U.S. singles on Atco. Bob Dylan snagged them for his 1966 world tour, which raised their profile and led to a contract with Capitol Records. Robertson's "The Weight" was issued as a single crediting all five members (the 45 label read Jaime Robbie Robertson, Rick Danko, Richard Manuel, Garth Hudson, Levon Helm) just before they shortened it to the most simple of names, The Band, with the album Music From Big Pink, which jump-started a few decades of incredible popularity. In 1970, Hawkins made a minor commotion with a rockin' Muscle Shoals recording of The Clovers' '57 scorcher "Down in the Alley." John Lennon and Yoko Ono befriended "Sir Ronnie" (as John called him) and they jammed together on several occasions during J&Y's post-Beatles-breakup peace movement period. Ronnie Hawkins stayed active, performing incessantly while continuing to make records, usually revivals of his favorite oldies, many of them Diddley songs, for Canada's Monument, Polydor, Epic and other labels. A well-known personality in the Toronto area, he has contributed to various music documentaries and enjoyed a side career as an actor; he played the role of Bob Dylan in the 1978 film Renaldo and Clara and appeared in 1980's Heaven's Gate in addition to many Canadian films and TV episodes.